Adobe0 RoboHelp is a professional authoring tool for developing help systems, eLearning content, knowledgebases, and policies and procedures. Its enhanced editing and layout capabilities enable you to create engaging interactive content and to publish to multiple channels - even as an Adobe AIR application - for an integrated online and offline user experience. With Adobe RoboHelp you'll be able to make your own personalized help systems in no time and with professional quality. NOTE: To install the software you need to download both files, the 7z archive and the extractor (.exe) and run the latter. · Publish your help system as an Adobe AIR application with support for adding tabs, favorites, new templates, and auto-generated mini tables of contents. Take advantage of advanced features such as commenting and online/offline synchronization. · Enjoy full support for XHTML standards, including the ability to check your content for World Wide Web Consortium (W3C) compliance. 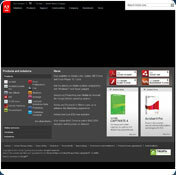 · Export your Adobe RoboHelp project as an Adobe AIR application for e-mail-based or online reviews. Aggregate and manage comments from multiple reviewers in a single file. · Import multiple Word files at one time, along with indexes, glossaries, and tables of contents. Easily map Word styles to RoboHelp styles. Repurpose Word content for HTML on import, and use markers to identify context-sensitive help topics. · Use new scripting features to generate custom reports, automate frequently used workflows, and even extend RoboHelp functionality. Take advantage of command-line support, a script management interface, and script editing and debugging tools. · Work with a completely enhanced CSS Style Editor that allows you to define and edit List and Table styles. · Take advantage of new support for master page creation as well as advanced interface features such as breadcrumbs, mini tables of contents, and "see also" references. · Enhance search results with ranking, wildcard, metadata, and multiple language results. Users can search contextually and browse topics, as well as search PDF and Microsoft Office documents. · Easily integrate Adobe Captivate show-me demos and how-to illustrations with help files. You cannot download any crack or serial number for Adobe RoboHelp on this page. Every software that you are able to download on our site is legal. There is no crack, serial number, hack or activation key for Adobe RoboHelp present here. Our collection also doesn't contain any keygens, because keygen programs are being used in illegal ways which we do not support. All software that you can find here is freely downloadable and legal. Adobe RoboHelp installation package is prepared to be downloaded from our fast download servers. It is checked for possible viruses and is proven to be 100% clean and safe. Various leading antiviruses have been used to test Adobe RoboHelp, if it contains any viruses. No infections have been found and downloading Adobe RoboHelp is completelly problem free because of that reason. Our experts on malware detection tested Adobe RoboHelp with various spyware and malware detection programs, including fyxm.net custom malware and spyware detection, and absolutelly no malware or spyware was found in Adobe RoboHelp. All software that you can find on our servers, including Adobe RoboHelp, is either freeware, shareware or open-source, some of the software packages are demo, trial or patch versions and if possible (public domain licence), we also host official full versions of software. Because we want to be one of the fastest download sites on the web, we host all the software including Adobe RoboHelp on our servers. You cannot find here any torrents or download links that would lead you to dangerous sites.